As you know, we at the Inn on Mill Creek B&B are big supporters of our talented local artists, including those who are members of the Swannanoa Valley Fine Arts League. 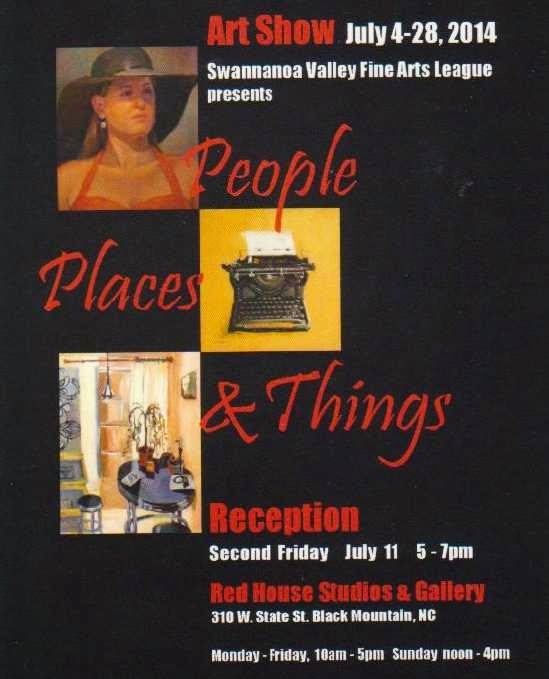 So we wanted to make sure you knew that the SVFAL has an art exhibit showing in July of 2014, called People, Places and Things, at the home of the SVFAL, the Red House Studios and Gallery near the Monte Vista on West State Street in Black Mountain. People, Places and Things will feature selected works by SVFAL members, showcasing, you guessed it, people, places and things. Curators for the show are Pat Cotterill and Lynn Newhouse. A reception for People, Places and Things will be held on July 11, from 5pm to 7pm. You can check out the July art show at the Red House Monday-Saturday (10am-5pm) and Sundays (noon to 4pm). We highly recommend it! Next up for the SVFAL is the 47th Annual Juried Exhibit in August. Learn more about the Swannanoa Valley Fine Arts League at www.svfalarts.org. This entry was posted in Uncategorized and tagged art, Black Mountain by Inn on Mill Creek. Bookmark the permalink.